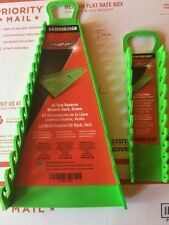 Snap On Bench Top Utility Mat 24" x 16"
The bottom corners feature a protractor diagram for selected angles. It is in very good to excellent condition. There are few scratches, none of them are deep. There isn't any rust or dents. Boxes and trays often have a lot of wear on the bottom, this one doesn't- it hung in my roll cab. 3 Used, not abused trays for small parts or tools. Fits drawer size 14 1/4" by 26 1/2". Depth 3 " or larger. There are 2 wrench holders. Flexible wrench grippers hold a total of 25 wrenches. The color is Green. So i had to go back to my single rails. The Tray still looks new. Look at the pictures to get a better idea on the condition of the item. This has the Embossed lid and was red. Snap on Tools Toolbox Logo. Actual Emblem For Snap on Toolbox. Here we have 2 Snap-On magnetic socket trays. They both hold 12 sockets. PAKTY227 AND PAKTY211 The lid PAKLD070 will fit on either one. CASE ONLY for Snap On tools magnetic bit set. Hand holds are present on each end for carrying. This kit bag is in rough shape. There is missing stitching, no tie, and is a bit dirty. Flexible wrench grippers hold a total of 25 wrenches. Reverse wrench holder and a stubby wrench holder. There are 2 wrench holders. One reverse and one stubby holder. The reverse holds 15 wrenches and the stubby hold 10 wrenches. The interior of the trays are also magnetic to secure tools or fasteners. Trays are heavy duty made to hold loose tools or hardware. Hand holds are present on each end for carrying. Snap On Tools. PAKTY171 1/2” Drive Socket Tray Organizer. 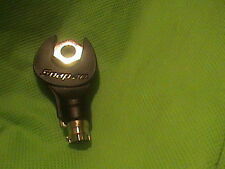 No PAKTY217 ~ HOLDS 7 ~ 3/8" Dr SOCKET. Believe these are for a Snap On Socket Set BCS 70A. NEW / NEVER USED . New in plastic set of 2 Snap-on raised black and silver polyurethane toolbox handle decals. 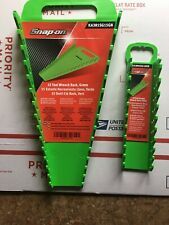 NEW Snap On PAKTY075 1/2” Drive Socket Tray Organizer. 3/8in. To 1-1/8in. Snap On Tools. PAKTY075 1/2” Drive Shallow Socket Tray Organizer. To 1-1/8in. Up for sale is a great side box Made in the late 70 or early 80s. Made in Canada. This box was made when Snap on was making good quality boxes. Paint is scratched, scraped, chipped, faded in areas and has paint over spray.But oh is it solid. I examined the box for dents and did not notice any. The top had a cover on it and is why it is shiny red. For sale is a Snap ON limited edition Cheverolet Large Tool Box. The model number is KRL722PAWSD. This includes a key also. This toolbox is in good overall pre-owned condition. Signs of wear include surface scratches, scuffs and dirt/ dust residue from normal use and storage. Snap-On Tools PAKTY226 3/8" Magnetic Socket Holder and Cover Only For 214FSY Deep Socket Set. Shipped with USPS First Class Package. Snap On EPIQ SideKIQ 6 Drawer Roll Cart Gloss Black w/ Bedliner Top Huge Cart !! • Lid styling and height to match any EPIQ because it is an EPIQ, so it blends in next to an EPIQ roll cab. Overall condition is Very Nice! This can easily replace a tool box plus it rolls very easily. This is a mini scale Snap On top tool box with 3 functional pull out trays. This is a mini scale Snap On top tool box with 3 functional pull out trays. Occasionally I do make mistakes and will do my best to help correct the situation. This is a Snap On tool bag. Appears to be canvas. It has never been used, it’s just been sitting in my toolbox. I can’t even remember which tool I got it with. Great condition, and brand new. May have a mark or two from just being in a toolbox, but it’s perfect overall! I have a few other bags I’ll be listing, thanks for looking! Sorry shipping will be a little on the high side. Prices for shipping have gone through the roof. Offers will be considered! Snap-on tool bag. Canvas outer with nylon inner lining. Inner pockets and 3 outer pockets on each side. Zip closure. Bag folds flat for easy storage. Used in excellent shape. If its not in the Pictures its not included. Snap On Tool Box. Box is appr 26" by 15" by 12". Box weighs 65 lbs. Box has dents, paint loss & signs of use. This is an OEM Snap on tool box handle. Only took it out for pictures. Has all hardware to mount. Snap On Canvas Tool Bag NICE! NICE Snap On Canvas Tool Bag. Snap On Tools. PAKTY Short Wrench Tray Organizer. For OEXS709. Cracked as shown in picture. For sale is a MINT Snap-On USA Red SRPC112 Snap Ring Pliers 12 Pc Set CASE. This case is in MINT condition. WRENCH SET TOOLS. Morgantown, WV 26505. JCLG Enterprises, Inc LIGHT WEAR AND TEAR. MODEL KRL1033 BOX AND KRL7972 HUTCH. SNAP-ON TOOL BOX & HUTCH. GOOD USED TOOL BOX. Snap-On Intimidator Mini Tool Box - Top Portion Only - 12.25" x 4.5" x 4.5"
Model: pakty360 -. WRENCH SET TOOLS. 7 pc wrench set in blk tray. Morgantown, WV 26505. JCLG Enterprises, Inc (ID: 200440-7 ). Part Number:LSR1213. Aluminum socket rail for light weight and durable. 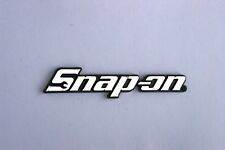 Snap On Logo. MINI Snap-On jewelry box (Intimidator) - Special Edition, Full Set Used - but in excellent shape. RARE NEW SNAP ON TOOLS BLACK PROMO LUNCH BAG 10” W x 9”H / LUNCH BOX / COOLER TOTE // BLACK WITH WHITE LETTERING. Genuine Snap On Tool Box Decal 1950's Vintage Style Logo, 6.25"
Staying organized is an important part of any business, and a toolbox provides a variety of tool storage options to automotive and manufacturing industries alike. It's just as important that you're able to choose the right toolbox for your needs, and the Snap-on brand has designed several boxes for a variety of storage options. What are the benefits of a toolbox? While some tools come with dedicated cases for protection, they don't act as a general toolbox, so there isn't any space in there to store extra tools. Most tools you buy do not come with dedicated storage, but there are good reasons to invest in a Snap-on toolbox. Most notably, a good Snap-on toolbox will protect your tools. While using something like a ratchet set or socket wrench may result in a few scratches here or there, prolonged exposure without protection can result in your tools taking more serious damage that may affect their performance. Some may also develop rust or other issues that you'll need to deal with before you can use them again. A Snap-on brand toolbox will also keep your things organized, which makes them easier to find and use when you need to do a job. Many such boxes come with specialized compartments or drawers for storing specific sizes and types of tools, making it easy for you to have exactly what you need, when you need it. In addition, a Snap-on toolbox offers convenience, as you'll know where all of your tools are at any given moment, and you can take them to and from work sites each day using one handy box. Lastly, a Snap-on toolbox provides peace of mind and security, as you will be able to keep all your tools safe. You may consider a lockable chest, cabinet, or box for your needs. What are some types of Snap-on toolboxes? You know the benefits of a good tool-storage system but you also need to know some of the types available so you can choose the one that fits your needs. A portable parts box or cabinet like those offered by Snap-on is useful for storing all the small, loose items you need throughout your workday, such as screws, bits, bolts, and more. A dedicated socket holder will organize all the various sizes you may have so you'll have no trouble finding and choosing the one you need. A stainless metal tool cabinet will have space enough for a variety of different tools. You can organize toolsets by drawer if you wish, and it's tall enough that you won't need to bend or strain when selecting the items you need. A tall toolbox like this will roll on wheels so you can move them about the work site. For lightweight portability, you may want a simple toolbox that's more of an organizer kit, such as one that holds your entire wrench set, but in pouch rather than box form, and folds up for transport.